Watch our video and access our FAQ section below. Thanks to the pioneering work of world-renowned Nanotechnologist and Oncologist Dr. Esther Chang of Georgetown University, even those with advanced stage cancers stand a fighting chance of surviving. Dr. Chang has developed a treatment for advanced stage cancers that utilizes nanomedicine technology. What sets this treatment apart from any other treatment is that it delivers drugs specifically to cancer cells WITHOUT affecting normal cells. In animal studies, this treatment cured ALL OF THE MAJOR CANCERS without toxic side effects prevalent with traditional treatments (hair loss, severe nausea, etc.). Moreover, while drugs used to treat common side effects typically cost thousands of dollars, with Dr. Chang’s treatment, no additional drugs would be required. Thereby, this treatment saves patients a substantial amount of money. Help us ensure this treatment is available soon. The only major obstacle standing in the way is the completion of FDA studies . . . which requires additional funding. Dr. Chang’s nano-delivery system uses minute nanoparticles that not only accurately locate and attach to cells in primary tumors, but also target and attach to cancer cells that have metastasized to other parts of the body. The therapeutic agents carried by the nanoparticles are then transferred into the cancer cells, killing them. This tumor targeted delivery system greatly increases treatment effectiveness, enables healthy cells to be spared, and eliminates harmful side effects. In recent years, the term “targeting,” when applied to cancer therapy, has been used to describe treatments that focus on specific molecular pathways within cancer cells, which are important in cancer cells’ growth and expansion. If these are blocked, the cancer may be halted, at least temporarily. Unfortunately, in most instances, the cells find other pathways to continue growing, and the cancer again starts to spread. In Dr. Chang’s treatment, there are two targets, one within the cell as described above, and the other, the cancer cell itself. By placing various chemotherapeutic agents or other anti-cancer agents (which target pathways inside of the cancer cells) in her drug delivery vehicle, and directing those vehicles specifically and much more effectively against cancer cells themselves, she has been able to overwhelm those cells without giving them an opportunity to recover. What is Cancer and What New Information Do we Have? We have learned much about cancer that was previously unknown. It has been recognized that cancer is characterized by uncontrolled growth of abnormal cells, but it was not fully understood that preceding damage or alterations in our DNA were responsible for its development and evolution. Furthermore, while such damage might be due to various environmental exposures (e.g. intense sunlight, cigarette smoke, etc. ), or inherited changes, there is commonly a long delay period between its occurrence or development, and the clinical expression of the disease. Thus, an individual who had several sunburns as a child, might not develop a melanoma skin cancer until they were 70, while in some instances, this time period is very short. It is now understood that many cancers tend to be evolving diseases where a series of genetic mutations occur sequentially, allowing the cancer to grow abnormally, then to invade local tissues, and finally, to spread (metastasize) through the body. Extensive cancers do not differ from localized cancers simply in their volume, but also in their genetic makeup, ability to do harm, and common resistance to therapies. Strategies to detect cancers in their very early stages (read about the skin screening program recommended by The Delivering Cures for Cancer Foundation) can result in extremely high rates of cure (100% survival from all skin cancers over 24 plus years) because these cancers are localized and far less formidable when detected. Simple surgery is usually curative. For more advanced disease, where cancer cells have spread extensively through the body, treatment is more challenging. Ideal therapies would eliminate all cancer cells, wherever they reside, while inflicting minimal damage to normal cells and tissues. Currently available treatments, even many that were recently introduced, frequently fail to do this, and thus, true cures in patients with advanced disease are commonly not achieved. Very recent developments in nanomedicine hold the promise of a far more optimistic outlook in the future. Our Foundation’s mission is to make these advances available to all who need them as soon as possible. When cancers are discovered in their early stages and have not spread to other locations, local treatments such as surgery, radiation, and other destructive measures can be employed. These tend to produce very high rates of cure because the cancer can be removed in its entirety. The Delivering Cures for Cancer Foundation supports the use of serial screening programs for patients identified as being at increased risk of particular cancers, so that such cancers, should they develop, are likely to be detected before symptoms develop, and when there is the likelihood of cure. Unfortunately, many cancers are not discovered until symptoms develop. In lung cancer and pancreatic cancer in particular, such cancers are commonly quite advanced and metastases have occurred. Regretfully, current therapies for such cancers commonly fail, though some recent innovations have extended lifespan and a small number of patients have experienced notable remissions. Treatment for extensive and metastatic disease may include various chemotherapeutic drugs, radiation, immunotherapy (where vaccines or other measures are taken to try to obtain the support of the patient’s own immune system to help eliminate the cancer). Receiving considerable attention in recent years is “targeted therapy.” It should be noted that these “targeted” therapies most often do not target the surface of cancer cells specifically, but rather they target certain checkpoints in the molecular pathways and are activated in certain cancers once they are already delivered inside of the cancer cell. If these pathways are successfully blocked by treatment, the cancer may stop growing and spreading, which may lead to regression. Unfortunately, this is often only a temporary situation as cancers frequently utilize alternative pathways to continue growing and expanding. Though frequently extending survival time, true cures are the exception. Since these pathways are also important for the growth of normal cells, when they are blocked, significant side effects may develop. For many advanced cancers, we currently do not have therapies that lead to a high cure rate in a majority or even a substantial percentage of cases. Many of these treatments have significant undesirable side effects (e.g. reduction in white blood cells, increased risk of new cancers, etc.). The high cost of treating cancer has become a major problem. Treatments for advanced disease commonly run well over $100,000 per treatment cycle. Humanity is in desperate need of newer treatments that will be much more effective, less likely to cause side effects, and ideally, more affordable. Newer developments in the realm of nanomedicine hold the promise of significantly impacting all of these issues. What are Nanomedicine-Based Cancer Treatments and How do they Help Resolve Current Problems? Nanomedicine includes the use of nanotechnology to advance the field of medicine. Nanotechnology is a relatively new and rapidly advancing field involving the designing of extremely minute particles with specific features, which enable them to exhibit new and specific properties. Considerable research is going on worldwide to develop nanomedicine-based cancer treatments. These typically involve construction of so-called nanoparticles, which are made to transport anti-cancer drugs, genes (DNA), RNA, or other materials which can kill cancer cells directly and/or render them much more sensitive to other therapies. Because of their special targeting capability, not just their small size, nanoparticles can pass readily through the blood-brain barrier and other compromised areas, which most standard chemotherapeutic agents fail to do. In the most promising of studies performed by Dr. Esther Chang, Professor of Oncology at Georgetown University, particles have been constructed with “targeting molecules” on their surface that selectively attach to cancer cells. After the attachment of a nanoparticle to a cancer cell has occurred, the contents of the nanoparticle enter the cell and lead to its demise. Because of the specificity of these nanoparticles for cancer cells and their relative lack of affinity for normal cells, significant antitumor benefits have been observed both in animal studies and in early human studies. The treatment has been shown to be significantly more effective, with cures of multiple common cancers realized in animal models. The treatment has been shown to be safe in FDA-approved human studies in patients with advanced cancer. Because less drugs are needed in this treatment system, and because the costs to treat side effects is reduced, current expectations are that total treatment costs will eventually fall. This new approach to treating cancer is not only extraordinarily promising, but appears capable of resolving many of the major problems associated with current cancer therapy. Why do we Believe Nanomedicine-Based Treatments will Cure Cancer? How do Current Chemotherapeutic Treatments and Nanomedicine-Based Treatments Interrelate? Studies to date suggest that nanomedicine therapies with the ability to target cancer cells specifically will deliver significantly enhanced efficacy and safety when compared to non-targeted chemotherapeutic treatments. Does this imply that such current therapies may all be replaced? Not at all. The greatest efficacies to date appear to have been achieved when the targeted nanomedicine delivered the p53 tumor suppressor gene in combination with a standard chemotherapeutic (see video “How the Nanodelivery System Targets Cancer Cells Specifically”). Delivery of the normal p53 gene prior to standard chemotherapy has been shown to render the cancer much more sensitive to treatment so that some cancers have been cured when this was not achieved with the same chemotherapeutic agent alone in animal tumor models. Due to the versatility of the nanodelivery system, certain chemotherapeutic agents could be incorporated into the nanoparticles, thus becoming much more effective and less likely to produce adverse effects. This might be particularly important in brain tumors and metastases to the brain as the so-called blood-brain barrier tends to interfere with standard chemotherapies reaching the locations in the brain where they are needed. The targeted nanodelivery system has no difficulty reaching such sites. It is possible that there are highly effective, but unfortunately too toxic, anti-cancer agents “gathering dust” on the shelves of some pharmaceutical companies. Such agents might be given new life when incorporated into the nanoparticles as toxicity might be significantly reduced. 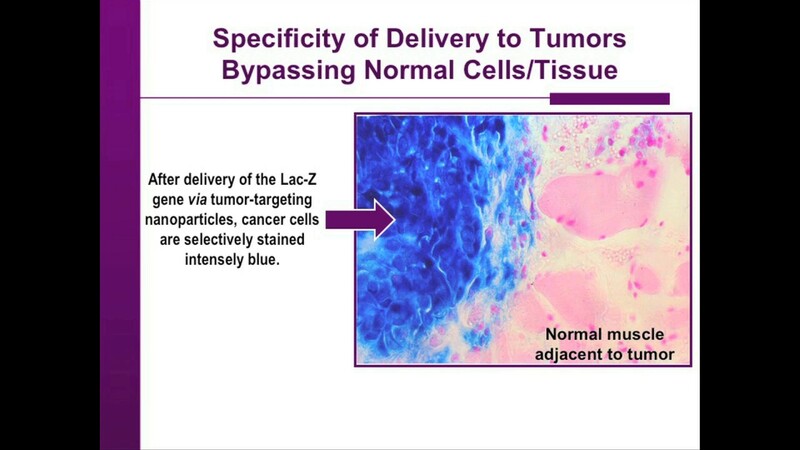 Due to both the tumor-targeting ability and flexibility of the nanomedicine system, multiple approaches become available to treat cancers with more than one agent being delivered by the targeted nanodelivery system to achieve previously unattained rates of efficacy. Are the Technologies Described on this Website Currently Available, and If So, Where? The three technologies described: serial screening for early detection of skin cancer, The PAULA’s Test for early detection of lung cancer, and the nanomedicine delivery system developed by Dr. Esther Chang for treatment of advanced cancers, are available, to a limited degree. Now in its 25th year with 100% survival from all skin cancers in program participants, Dr. Ronald Shore’s serial screening for skin cancer could be offered by any dermatologist who is familiar with the program. In the last few years, details of the program have been presented internationally as well as at sessions of the Annual Meeting of the American Academy of Dermatology. A review of this program was published in The Journal of Drugs in Dermatology: Drugs-Devices-Methods. 2011;10(3):244-252. This article (in PDF) is provided with compliments by the Journal of Drugs in Dermatology (JDD). The PAULA’s Test for early detection of lung cancer, developed by 20/20 GeneSystems, Inc., is now available in physician offices in Washington, DC and parts of Maryland and Virginia, with plans to expand its availability in the near future. Physicians and patients outside this area who are interested in the test can contact 20/20 GeneSystems at 240-453-6339 or by email at www.paulastest.com. The nanodelivery system developed by Dr. Esther Chang for treatment of advanced and metastatic cancers is currently only available in clinical trials that are being performed at cancer centers in the United States. Information regarding new specific trials and availability for participation in such studies can be checked at clinicaltrials.gov. In order to assure the effectiveness and safety of new treatments, the government, through the FDA, has set up a sequence of procedures that researchers must follow before approval is given for human use. In Phase I, it must be demonstrated that the treatment is safe, and this has already been accomplished for the nanomedicine treatment employing the p53 gene described above. In Phases II and III, it must be shown that the treatment is effective for each particular type of cancer. Such studies tend to be very expensive, costing 10 to 40 million dollars each for Phase II studies alone. Consequently, considering the number of cancers that exist, to determine the best variant of treatment for each type of cancer can become exorbitantly expensive and generally prohibitive for most researchers. No funding agencies will likely be able to support these types of clinical studies. Our foundation seeks to help remedy this situation by educating the public so that adequate funding can be obtained to accelerate completion of remaining required studies. We seek contributions from all possible sources: individuals, philanthropists, other nonprofits, industry, government and any others who share our vision of conquering this disease. Of equal importance, we would ask that you spread our message to family members, friends and other people and organizations you know who may be interested in partnering with us. If you would like to formally join our mission, please contact us. We would sincerely and warmly welcome anyone who wants to do what they can to make a difference! Year after year, more than half a million lives are lost to cancer in the United States alone. That’s an enormous death toll with unfathomable human suffering. Let’s not let this continue. Now we can work together to defeat this disease — so let’s do so — and as soon as possible!